Published: April 27, 2017 at 08:37 p.m. The San Francisco 49ers select Stanford defensive end Solomon Thomas No. 3 overall in the 2017 NFL Draft. Published: April 28, 2017 at 12:38 p.m.
Go behind the scenes in the San Francisco 49ers Draft War Room, and see the moment Stanford defensive end Solomon Thomas received the call to be drafted. Published: April 27, 2017 at 08:44 p.m.
NFL Media's Matt Smith, Bucky Brooks, and Lance Zierlein give Solomon Thomas an A draft grade. 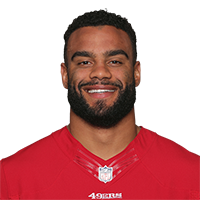 Published: April 27, 2017 at 10:22 p.m.
Solomon Thomas takes a look at his new uniform with the San Francisco 49ers. Published: April 27, 2017 at 09:01 p.m.
Social media reacts to Solomon Thomas selection. Published: April 27, 2017 at 10:23 p.m.
NFL Media's Ike Taylor and Dave Dameshek talks to Solomon Thomas after he was drafted by the San Francisco 49ers. Published: April 5, 2017 at 12:15 p.m.
Stanford defensive lineman Solomon Thomas goes through drills at the 2017 NFL Scouting Combine.